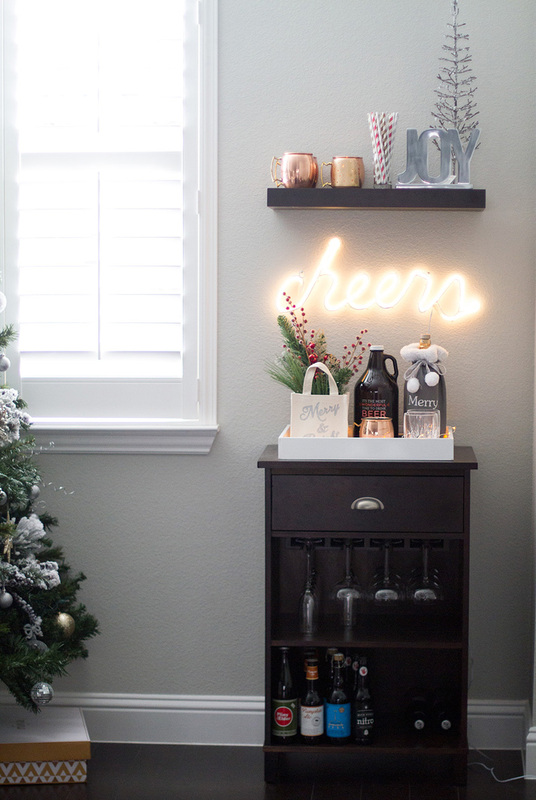 With just a few accessories, I transformed my little bar cart area at home into a, festive, holiday bar cart! 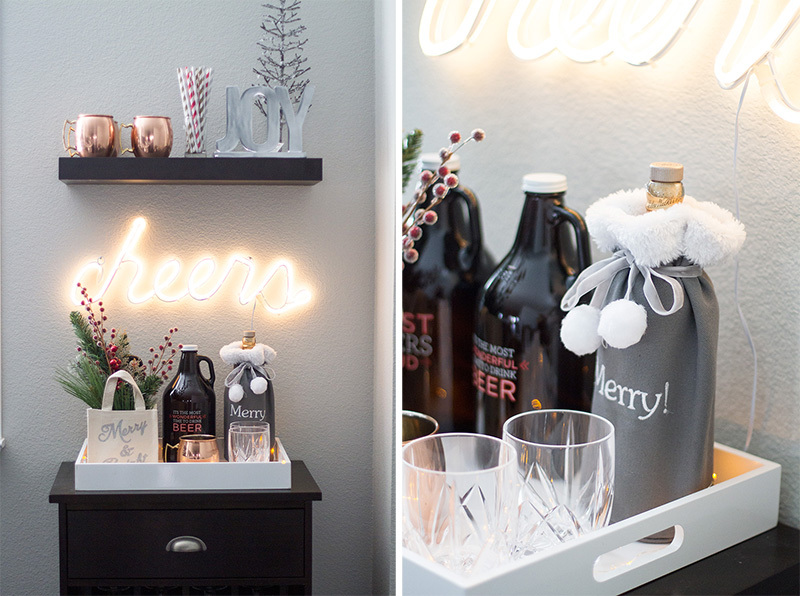 I found these holiday themed beer growlers at Target and thought they would go perfectly since me and my husband are both craft beer lovers. It’s also a nice way to fill up some space on the tray when we run out of our liquor bottles! I originally wanted to add some garland around the bar but I couldn’t find any nice ones that were short enough to fit around it. So instead, I found this little tote (that says “Merry and Bright”) at home goods and put a bouquet of pine inside it along with some cranberry picks for a little color. 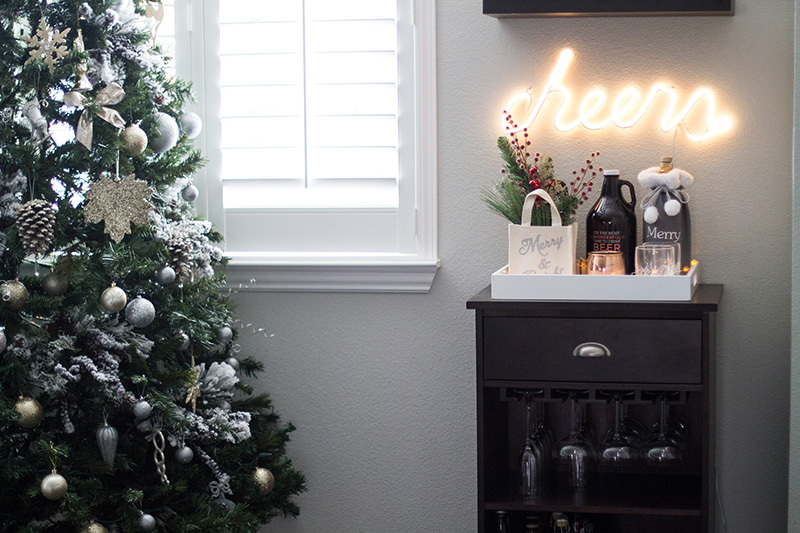 The Cheers light, I actually bought in November… and have had it up since! I will probably end up leaving it up since it just fits perfectly about the bar cart. Side note: I have it plugged into a smart outlet (that is connected to a wink hub) and set on a timer and turns on when my Christmas tree does. That way I don’t ever forget to turn it on! Needless to say, my home has been all set and ready for Christmas (which I can’t believe is already next week) for a few weeks now. If you want to see my Christmas table decorations, then just head over to this post and take a look!